When I saw it in person at PhotoPlus Expo last year, I could not believe that it was really a polarizer. Take a look at the below image. How can something that light be an effective polarizer? I decided to put them to the test. The below images show the same clouds only a few minutes apart with my 40D & 85mm L f/1.2 lens, tripod mounted. The polarizing effect between the Pro1 and the HD is virtually the same. The BIG difference between the filters was in the light transmission. I was able to get more than 1-stop using the HD filter! In low-light situations, that extra light can be very helpful. But, in bright light situations, you may want the extra filtering power of the Pro1. ← Previous Previous post: Looking for a bargain? Shop on the Web. No, the Pro1 filter is darker. In Shutter Priority mode, I was able to open the aperature with the HD to f/2.2. Did you use, for the comparison, a “Pro1” version or a “Pro1 Digital” version of polarizer? I bought Hoya’s PRO1 when it was first introduced a few years ago. Since then, they have rebranded it PRO1D. It’s the same filter. I think you meant 1/2-stop by going from F2.8 to F2.2, and not 2-stops. 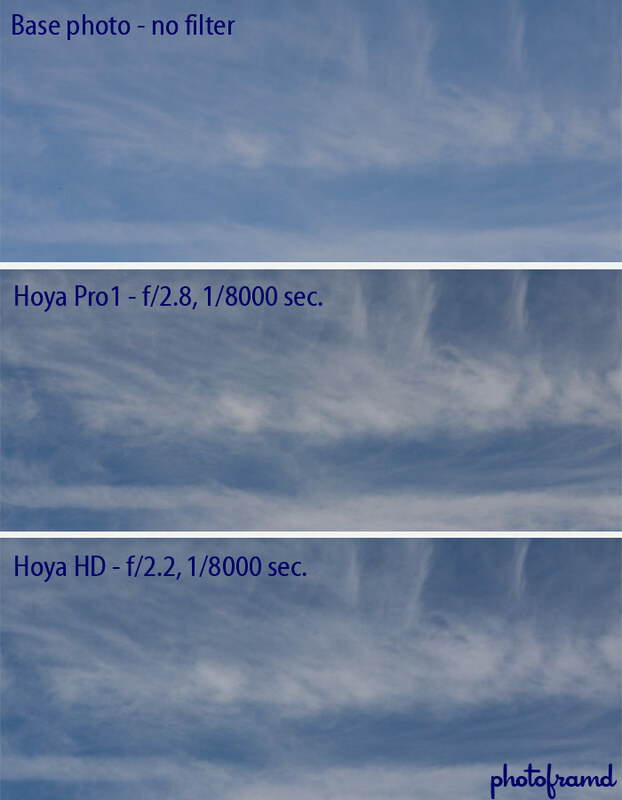 Other users of the Hoya HD have also experienced the 1/2-stop increase in light transmission compared to the Pro 1, but definitely not 2-stops. Well sorry, but I really don’t get this. “You were able to open the aperture to 2.2” – doesn’t this mean that you needed to open the aperture to 2.2, to get the same amount of light? Or put another way, the Pro1 got the same amount of light with a smaller aperture? Polarizers block light. There is no way of getting around that. The issue here is how much light is blocked by the Pro1 and the HD filters. The HD filter blocks less light which can mean the difference between using a polarizer or not under low-light or hand-held circumstances. Also, If you are trying to create a very shallow depth of field by using a wide aperture, the HD filter will allow you to go wider (in this example 2.2) than you can with the Pro1 filter (in this example 2.8). I have not recreated this test using the Canon 7D, but I expect similar results. After using the HD filter for over a year, I find it to be more neutral in color than the Pro1. I feel the Pro1 adds a slightly muddy cool gray cast to the images. I am very happy with the HD filter. Why aren’t you publishing my comment I made yesterday on your miscalculation of fstops ? You are talking about 2 fstops but the difference between the 2 filters is 2/3 stops max ( f2.8 vs f2.2 ) according to your test and only 1/3 stop ( 25% ) according to Hoya . If you are not open to criticisms , please close your topic to opinions so that we don’t bother responding . First of all, this is MY blog and I am entitled to take a week off. Second, had you bothered to read the other comments, you would see that I already addressed this question. 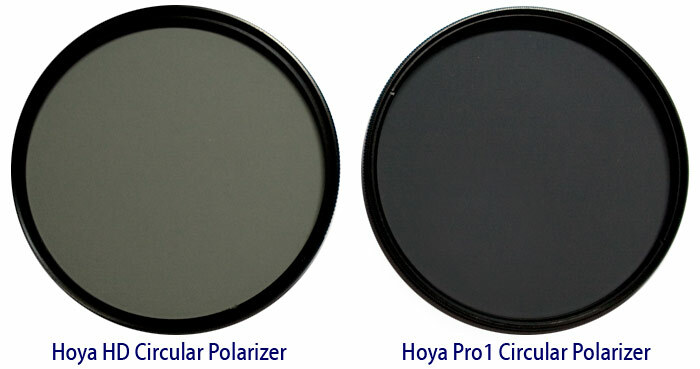 Take a look at Ken Rockwell’s discussion on the Hoya HD polarizers. Finally, send me the address of where you will be taking a vacation, so that I can harass you when you are taking some time off. this only means that hd is darker! The whole point of the comparison is that the HD filter which allows more light to enter the lens yet still provides a true polarizing effect. If you look at the two filters sitting on a solid white background, you can tell the HD filter is lighter than the Pro1. The Pro1 is a very dark filter which can be a problem when you do not have a significant amount of light (or a very wide aperture) but still want to pull out details in clouds or remove glare. The HD filter is perfect to remove reflections/glare from windows in street photography. I also have found the HD filter to be much more of a neutral filter while the Pro1 creates a very cool cast over the whole scene. Both the HD and the Pro1 are expensive filters (especially in a 77mm size). I have both filters, but only the HD has a permanent place in my camera bag.